and eliminating your frustration with color! Acrylic Color Mixing Made Easy! My online video course is available for only $40.00! though Craftsy frequently offers discounts. Click to learn more and to purchase. Learn to mix colors without mixing mud! Increase your confidence in mixing color. Learn how to choose your OWN palette of colors that is balanced and successful. Be able to mix luscious darks and natural looking greens. Loose that overwhelmed feeling when looking at all of your color choices. Love discovering all of the color mixtures you can create without buying more tubes of paint! ...and many more color mixing tips you can apply immediately. 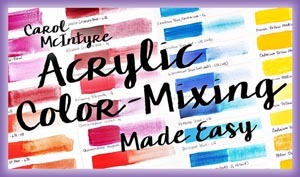 "Acrylic Color Mixing Made Easy." Painters working in ALL media are welcome. Even though I am working with acrylics in this course, the color principles and exercises I teach can be applied to ANY and all media. I have experience painting with every major medium and your questions are welcome. You will have access to me via questions you post online. Take this course in your home or studio and at your own pace. You will have access to it for a lifetime! When we painters walk into an art store it is like walking into a candy store. The tubes and bottles of paint sparkle like hard candy, shouting “Buy me, buy me!” and begging us to give them a taste. They are all so difficult to resist. We want one of each! On the flip side, being faced with hundreds of choices of brands and colors can be overwhelming and lead to feelings of paralysis and insecurity. Painting becomes less joyful, and the possibilities seem limited because our ability to express our creativity is hampered. It is not a happy place to be. I remember those days of frustration – vividly. Buying paints and mixing color was a guessing game, and mud was the frequent result. I wanted to be confident when I dipped my brush into my colors. I wanted to create paintings that connected with people; after all, color is the first element a viewer sees, and it is a powerful communicator. But this connection wasn’t happening. After a couple of years of painting, I needed answers. I began by asking art teachers for guidance. One instructor looked at my work and said that I already understood color. But I knew that color was one of the most difficult painting skills to learn and I was unsatisfied with what I was creating, so I felt his words were not truthful. I was surprised to discover that fellow painters were not interested in studying color theory. They bought into the myth that using color was intuitive and that one could therefore not be taught it. They also believed that studying color required too much thinking. I disagreed, so I set off alone, determined to find answers through sound color instruction. I lived in a large metropolitan area with a strong art community, but nothing existed. Needless to say, I was flabbergasted, which increased my level of frustration. Eventually I found a color course in a state university’s graphic arts department. I had to convince the professor to allow me – a non-registered older student – to attend a demanding, semester-long course. It is one of the most important decisions I have made in the 25+ years of my painting career. Meanwhile, I devoured every book about color I could find. (This was before the era of Internet, videos, and CDs.) I was determined to understand color and to feel confident using it. The college course and my own readings gave me the color language I needed and wanted, but something was still missing. The application of these color principles continued to pose a challenge. I was struggling to translate what I saw in my mind’s eye onto paper, and my paintings were not connecting with viewers. Then along came a small handbook by Moira Clinch entitled “The Watercolor Painter’s Pocket Palette.” It was this 8” x 6” spiral book that finally unlocked the color mixing mystery I was seeking. It set me free! It helped me put together all my knowledge about color. I now knew how to avoid mixing muddy colors and how to mix a bright color or a dull color. Using and studying color is no longer a drudge but a journey of discovery. Going to the art “candy” store no longer feels overwhelming. It is much easier to ignore the detractors and hone in on the color “flavors” I want to add or experiment with. I love to teach color because I want to help artists who feel frustrated and overwhelmed by color. My logical process simplifies color mixing unlike other color courses. My heart swells knowing that my teaching has opened up possibilities to painting students and offers a key to unleashing their creative potential. It brings great pleasure to have created a color mixing method that makes sense and is immediately applicable for any painting medium. My color mixing course “Acrylic Color Mixing Made Easy!” produced by Craftsy provides easily accessible color instruction worldwide. I am thrilled to be able to help painters end their frustration with color and begin enjoying its magic!